You are here: Home / Insurance News / What Kind of Insurance Does Your Cannabis Business Need? 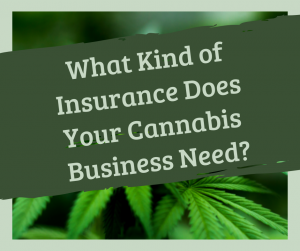 What Kind of Insurance Does Your Cannabis Business Need? The legalization of marijuana for recreational and medical use has prompted many entrepreneurs to venture into the cannabis industry, because of the potential for high profits and room for small businesses in the industry. One issue that these new business owners have encountered is the confusion and lack of information surrounding the steps they need to take to protect their business once they have started it. To mitigate the concerns of hazards that can hurt a dispensary, entrepreneurs should look to employment practices liability insurance, workers compensation, commercial auto, cyber liability, product liability, general liability, and/or property coverage. Product liability insurance can make sure that business owners are insured in case of an event where the cannabis products are damaged such as a fire, theft or some other disaster that would leave the products unusable. With a product such as marijuana that is relatively expensive and easily damaged, product insurance is almost a necessity. Many insurance carriers don’t offer coverage for non-FDA medication, such as marijuana, so it can be beneficial for doctors to go through an insurance broker that can learn about your practice and the type of coverage needed to make sure the practice and doctor are covered in the case of a lawsuit. For more information to better cover your cannabis business call 805-499-7300 or contact us online.